A lunch from Crossett Brook Middle School in Duxbury features whole-grain spaghetti with meat sauce, local apple, salad, broccoli, and a roll. A school meal from Vergennes Union High School features crispy chicken, Asian noodle salad, honey-glazed carrots, zucchini and a whole grain roll. A meal from Springfield High School features a chicken quesadilla on a whole-grain tortilla, salad, steamed carrots and daikon radishes, apples and carrot sticks. At Hardwick Elementary School, a salad bar offers multiple fruits and vegetables. Vermont schools offer free or reduced-cost meals to thousands of students every day. But how did schools become the venue to enact food policy? We're looking at school meal programs and the role they play in nutrition and education in school today. 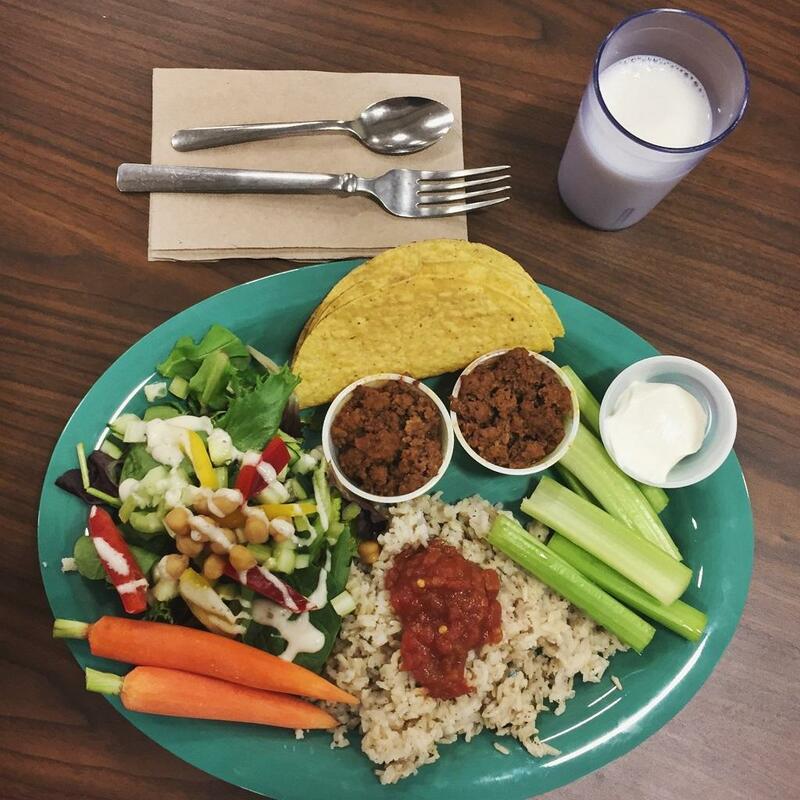 "Taco Tuesday" at Putney Central School offers beef tacos with New England beef, Cabot sour cream, Thomas Dairy milk, salad with garbanzo beans, brown rice, carrots and celery sticks. Rosie Krueger, assistant director of Child Nutrition Programs at the Vermont Agency of Education, discusses federal guidelines behind the free and reduced-price meals and how the meals are implemented across Vermont. Anore Horton, executive director at Hunger Free Vermont, explains the history of school meal programs dating back to the 1940s and the group's advocacy to expand those meal programs today. And Kathy Alexander, director of school nutrition for both the Mount Abraham Unified School District and the Addison Northwest School District, shares what it's like to write menus, order food and train staff to meet the nutritional needs of students in 2019. Broadcast live on Tuesday, Feb. 5, 2019 at noon; rebroadcast at 7 p.m. The school cafeteria is a boisterous scene, but anti-hunger advocates say that for low-income kids who don't get enough to eat, the cafeteria can be a stressful place that reinforces stigma. The nonprofit Hunger Free Vermont is working with school districts around the state to kick off this year’s statewide free summer meals program. High-quality child care in Vermont can be tough to find and tougher to afford. And elected officials from the governor on down seem to agree that this is a serious problem for the state. So what's being done to address the issue? We're looking at the state of child care in Vermont. And going through some of the ideas on the table to make that care more accessible and affordable.